Terrible news, everybody. The cyber weirdo who is trolling the internet pretending to be Ben Roethlisberger has imaginary cancer. There's a PayPal link below where you can help send him an virtual bouquet of AOL sign-up CDs. 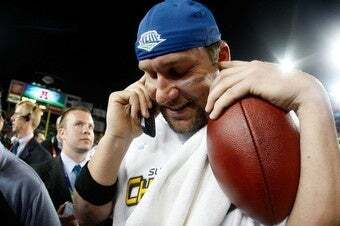 Apparently, Big Ben fans were slightly alarmed this week when he announced on his Facebook, MySpace and Twitter pages that he had been diagnosed with skin cancer. (Which makes total sense when you consider all the sun-drenched beaches in Pittsburgh.) But it turns out that not only does he not have cancer, he doesn't even have a Facebook page. Ben is "off the grid" as they say, which is why he has two Super Bowl rings and everyone who has ever left a comment on Digg does not. It's now been established that fake celebrity and athlete accounts make up roughly 60% of social networking sites, rendering the services even more pointless than they already were. There's been at least four fake NFL players exposed just this week and all it accomplishes is making bloggers look bad. Now why would you want to do that? Pretending to be someone else on the internet is the comedic equivalent of the "your shoe is untied" joke. Someone even created a fake Twitter account for me, which might be the saddest thing I've ever heard. Even my fake internet mom wouldn't read that. By the way, be sure to check out the Deadspin Twitter! It's just like reading Deadspin, but with fewer words!